Hibiscus is a versatile plant. With an upright shrub habit that can grow up to 6 ft tall when left alone, the versatile Hibiscus adapts itself to balcony gardens in cramped urban spaces and can be easily grown in pots as a creeper or hanging basket. In tropical conditions, it can enhance the beauty of any garden as the Hibiscus is a perennial and flowers throughout the year. 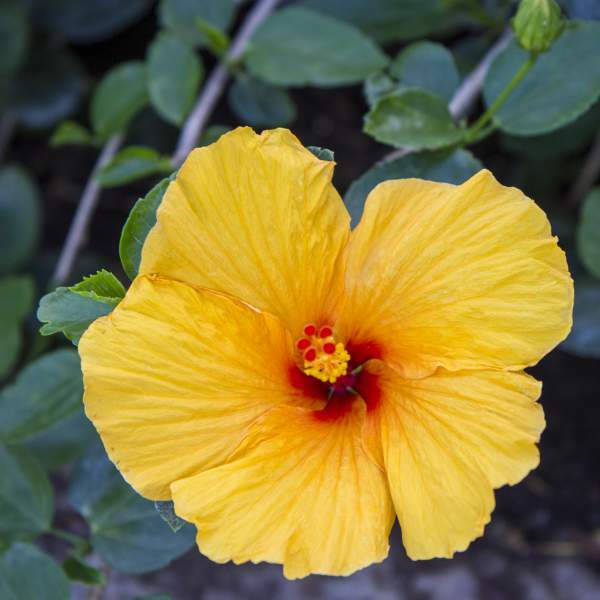 Hibiscus are an excellent choice for growers who are just getting started. For best results with Hibiscus, we recommend using a well-drained soil with a balanced fertilizer and a constant feed program of 200 ppm N. Maintain a pH between 5.5 - 6.2 and an optimal EC of 0.5 mmhos (2:1 dilution). Allow the soil to dry moderately between watering. For Yellow we recommend one pinch 5-10 days after transplant, once the roots are established. Hibiscus should be spaced adequately to allow airflow and light penetration between the foliage. Usually 2’ centers on baskets will be enough. Unless you are in zones 9-10 and growing them outdoors in full sun, we recommend using plant growth regulators to keep Hibiscus from stretching. Shaded and humid greenhouses cause the plants to stretch and grow thin stems, so compensate with a B-Nine spray at 2,500 to 5,000 ppm every two weeks after establishment of the root system. Whiteflies and mealybugs are the biggest pest problems with Hibiscus. Yellow are not prone to many diseases, but watch for botrytis and stem rot while the days are short. These rots are usually associated with wet or humid conditions. You can prevent them by allowing the plant to dry out between waterings, allowing for good airflow in your greenhouse, and spacing to allow the sun to penetrate to the soil level. The most common chemicals used to treat botrytis are Medallion and Banrot. Use them as a drench according to each label’s instructions. Plant one starter plant per 4” pot; plant it directly in the middle of your pot. Use a well-drained soil in your pot and plant your starter plants deep, allowing the ellepot to be completely covered by the soil. We recommend planting 3 starter plants or one 4” pot per gallon container. A gallon container can be stepped up to a 3-gallon if it becomes overgrown. Pinch 5-10 days after transplant, once the roots are established.